This is the sequal to the Block Box and is one of my favorites. The tiles on the top of this box are all made from different shades of walnut cut from the same board. The color versatility of walnut is one reason why it is so much fun to use as a material. 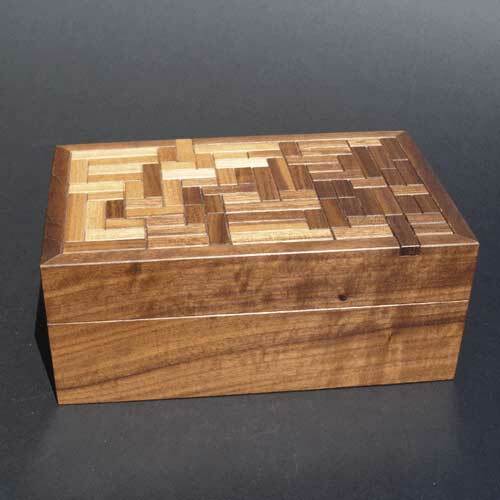 The tiles on the Walnut Block Box are arranged twice as efficient as the first Block Box. Instead of four settings, this has eight. A setting is any arrangement of the tiles so that the starting tile is pushed as shown in the photo to the left. The setting in the picture is one of the easiest settings, which requires only 23 moves to unlock the box. The hardest setting requires 168 moves to unlock the box. I use an 11 x 19 grid because it closely resembles a golden rectangle. If you add in the excess border, the rectangle is proportioned as 13 x 21. These are a pair of numbers in the Fibonacci sequence. The higher the Fibonacci Pair, the closer it resembles a special ratio called the Golden Ratio. I made 18 of these.